My baby is not gaining weight,How to increase my baby’s weight ,What foods help in increasing my baby’s weight,what is the ideal weight and height– These are the array of questions running in most of the mothers and this leads to serious stress in some mothers. I know how tough it is to handle the questions a mother of a non-chubby(but really hale and healthy) receives even if she is so confident that her child is perfectly fit. Many parents have written to me asking for suggestions on this and my only reply would be as follows ” Never bother about weight if your baby is healthy,active,achieving milestones right”. My insight on weight gain in humans is that it is majorly dependent on genetics. Hence you can’t compare baby X and baby Y of same age on weight and you can never the same weight gain in both babies. There are thousand more factors behind weight gain. And I always believe being chubby/plump/fat is not necessarily a sign of a healthy baby and being thin/lean doesn’t mean a baby is weak. Focus on growing a non-fussy eater and offer every single possible home made healthy food you can(You can find my experience on growing a non-fussy eater here). Let baby enjoy the table time and let it never be a battle.I always stress on providing healthy home made foods to babies regularly and cultivate healthy eating habits from day one and never bother on how much they eat and how much they gain. If you feel your baby isn’t gaining enough weight and your intuition says it is a serious issue please consult your pediatrician and take necessary steps. I am not an expert honestly. 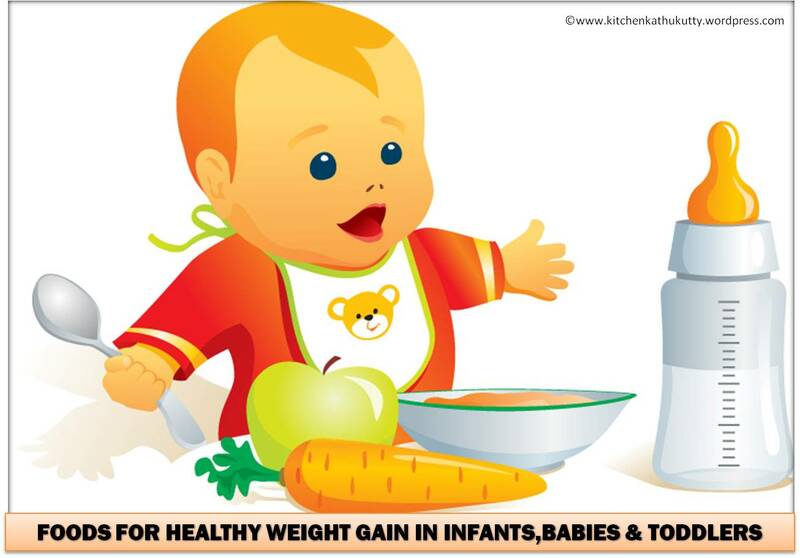 I am just herewith few food options which help in optimal and healthy weight gain in your little ones. These might work for you and not me and vice versa too. This is just an attempt to help you with whatever I have known and learnt.These are the results of my experiences,word of mouth from experienced mothers and friends,studies,doctor advice and personal knowledge. I hope and wish this helps you in some extent. I shall keep updating this section with my recipes and inputs regularly. 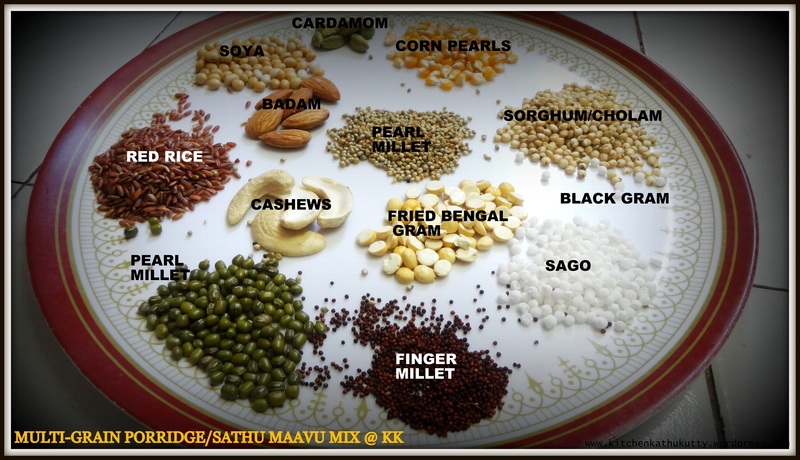 Please bookmark this page or follow my blog here or like my page at www.facebook.com/KitchenKathukutty to receive regular updates. Your genetic history might have a very slow weight gaining pattern. Poor latching,poor nursing pattern,Usage of pacifier,Some illness at birth,Ear infection,thrush,anemia,tongue-tie,reflux are few other reasons. The purest and the most lovable food available for babies is mother’s milk. This is the richest source of nutrients and it never depletes. Breastfeeding upto 2 years is strictly recommended and exclusive breastfeeding till 6 months is mandatory. No matter what mother eats, babies receive enough nutrition from mother’s milk. The fat present is mother’s milk is constant irrespective of mother’s diet. Never think of replacing mother feed with any food on this earth atleast till 1 year. Have a word with a doctor/lactation consultant if you have any issues with respect to feeding.However you can alter the type of fat and try to keep up the supply of breast milk with the help of few special foods for lactating mothers. Cow’s milk or Buffalo milk is a strict no till 1 year of age in babies. However all milk products like home made ghee,butter,curd,cheese,paneer can be offered after 6 months of age in moderation to babies if baby is not lactose intolerant. Use full fat cream milk for babies above 1 year(preferably plain milk) and milk products on daily basis for babies below 1 year. I shall soon post all home made milk products recipes with detailed images. As I start reading more to write down baby food recipes I found that certain fruits and vegetables which are rich in good fat and calorie can also help in healthy and optimal weight gain. 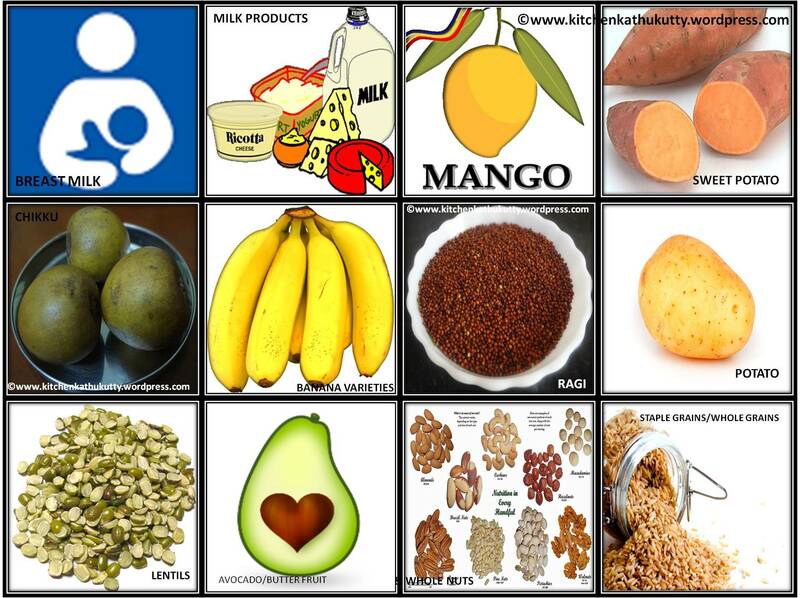 Few such fruits and vegetables are chikku/sapodilla,banana,mango,avocado,potato,sweet potatoes,pear. Try to offer them as fresh fruit puree or mashed fruits or finger foods. You can offer potatoes after cooking them well . This is one of the miracle grains I would call. A type of millet which is so suitable for babies and the only millet(as per my doctor’s advice) recommended from 6 months of age. It has loads of nutrients. Lentils/legumes/pulses are grains which are known for its protein content and including atleast a portion of them in daily meal is absolutely essential even for elders. When it comes to babies pulses like moong dhal and urad dhal greatly help in healthy weight gain. You can slowly introduce all types of pulses and legumes like soya beans,whole channa dhal,roasted bengal gram,bengal gram,masoor dhal etc. Include hing or garlic while cooking them if you fear about gastric issues. Dry fruits and whole nuts are the quickest and easiest options for immediate energy gain. But always use them in moderation. I would recommend you to offer nuts as such for elder babies . I add badam or cashew paste in all gravies. Any whole grain with the bran is an excellent source of nutrition and power house of good calories. So always prefer brown rice,red rice,red poha,millets for your babies and infants. Whatever is your staple food is always much healthier than any other food which was never known to your ancestors. 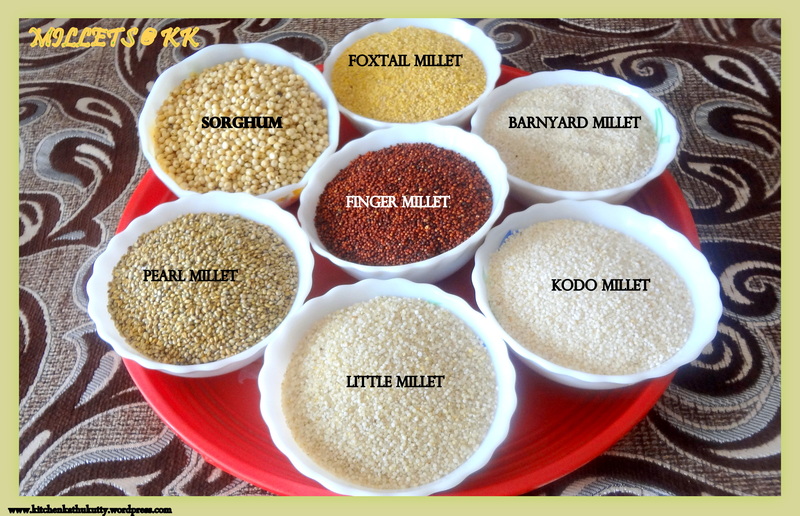 Find all millet recipes here. Do not over feed/force feed. Aim at optimal weight gain which is healthy.The numbers on weighing scale doesn’t matter if baby is fit and fine. Follow baby’s cues and your intuition than following any random diet charts.If your baby is healthy,active and falling on a steady curve of development slow weight gain need not be considered as an issue. The recipes listed are just a sample. For all recipes please refer this page.These are my suggestions based on what I have learnt,what I have experienced and what was advised to me by my doctors,elders,friends,kith and kin. Always seek medical assistance before implementing any to your baby. The above recipes are for babies from 0 day to 5 plus years. Please have a word with your doctor and decide on the recipe considering your baby’s health,age and family history of allergies. DO NOT REPRODUCE/COPY any part of this content in any way/form. Do you find this useful?If yes,please share among your friends and family. I shall keep updating this section with my recipes and inputs regularly. Please bookmark this page and do not forget to stay tuned with me by following by blog here and liking my facebook page at www.facebook.com?KitchenKathukutty or follow me on Twitter. Do share this with your kith and kin. For any queries please feel free to write to me at kitchenkathukutty@gmail.com or message me at http://www.facebook.com/Kitchenkathukutty. I request you to please refrain from sending requests in social networks. I might not be able to accept them due to few privacy concerns. Thanks for the understanding and support. Posted on 23/09/2015 31/10/2015 by Kalyani BalajiPosted in Baby FoodTagged FOODS FOR HEALTHY WEIGHT GAIN IN INFANTS, foods increasing baby weight, how to increase my baby weight, weight gaining foods for babies, what foods help babies in weight gain, why babies gain weight slowly.